'Boundless' brings the work of the diaspora to Berkeley. The exhibit includes mixed-media works by Tenzing Rigdol. Tibetan artists are making strides, both in their occupied homeland and among the diaspora communities. A new exhibit at the Berkeley Art Museum & Pacific Film Archive, Boundless: Contemporary Tibetan Artists at Home and Abroad, offers a peek into what some of these artists have been creating since the late 1980s. The exhibit opened in October and will be on view through May 26, 2019. Boundless is the first major exhibition to show contemporary Tibetan art in the Bay Area. The Bay Area Tibetan community is estimated to be about 3,000 and continues to expand as home to the fourth-largest Tibetan community in North America. The earliest significant group of Tibetan refugees began arriving in the United States and the Bay Area in the early '90s. Since then, the Bay Area has been a mostly welcoming community for the exiled community. For more than 20 years, for example, the city of Berkeley has raised the Tibetan flag at City Hall on March 10, which is known as the Tibetan National Uprising. 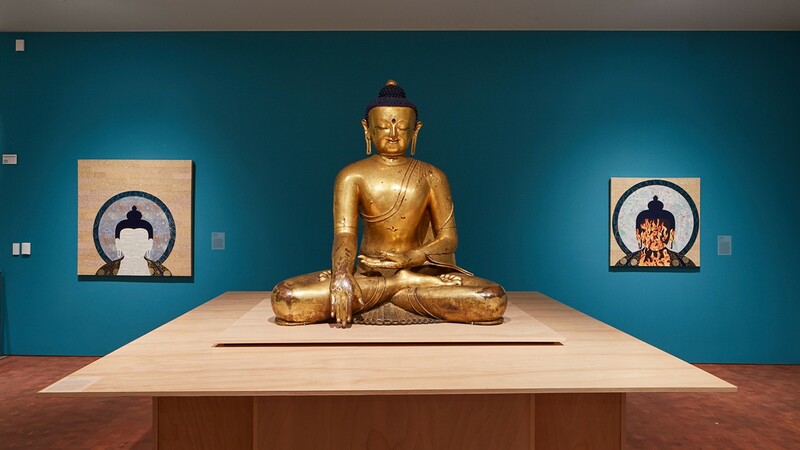 BAMPFA itself also has a history of collecting Tibetan art; interspersed with the exhibit's contemporary works are older pieces, including a large bronze Buddha statue on loan from a collector from the 14th century and 19th-20th century prayer wheels. The new works by Himalayan artists presented as part of Boundless, though, are mostly paintings, mixed media, videos, and collages that explore themes of identity, religion, displacement, and self-immolation — in this case, setting oneself on fire as a form of protest or sacrifice. Nicknamed the "Roof of the World" for its tall peaks, Tibet was once home to the Dalai Lama, the spiritual leader of Tibet. In 1951, China took over Tibet, which led to the Tibetan Uprising in 1959, which then led to many Tibetans fleeing the country. There are now about 150,000 Tibetans living in exile, with the largest population in Dharamsala, India, which is also where the exiled government is located. Tibet is seen as an occupied country with no U.N. representation. The dozen featured artists at BAMPFA either live in Tibet — also known as the Tibetan Autonomous Region (People's Republic of China) — or are spread across the globe, including in the U.S. and India. Curator Rosaline Kyo, who is Burmese and Chinese American, has spent months living in Lhasa, the capital of Tibet. Currently an assistant professor in Chinese studies at Davidson College in North Carolina, Kyo was encouraged to curate a Tibetan art show by her supervisor at BAMPFA last year when she was an Andrew W. Mellon Postdoctoral Curatorial Fellow. "A lot of the artwork included is through my personal knowledge of the artists and building relationships with them over the years," said Kyo. Among the dozen artists, Tsherin Sherpa's work is one of the most well-known. He recently gave a talk to a full house at BAMPFA in early October. Sherpa was trained by his father, Urgen Dorje, when he was 12 years old in the traditional religious art of thangka painting, typically passed down from father to son. Sherpa would have possibly continued in the traditional arts if not for a commissioned assignment from Jamba Juice. He was asked to create three posters for the company. That sparked the idea of using his thangka training to paint more experimental and modern art, including "Golden Child/Black Clouds," a striking close-up portrait of a young boy's face using gold leaf and cloud swirls — elements typically found in thangka paintings. Artist Chungpo Tsering, who spent time living in El Cerrito, said he has seen the Tibetan arts movement progress rather rapidly. He believes the 2008 Olympics in Beijing gave an international platform to the artists. "Most of the artists talked about illegal occupation from the Chinese," he said. "People noticed." Tsering's piece in the exhibit, "Ahimsa," is a charcoal drawing with gold leaf — a powerful and visually beautiful piece that addresses the self-immolation of monks in Tibet, with butterflies seeming to fly out of the subject's body. While most of the featured artists are men, there are some powerful pieces by women. One is an original five-minute video installation by mixed-race artist Marie-Dolma Chophel, who grew up in France. Her meditative video shows sand dropping from her hands, creating mountainous ridges over time, titled "Displaced Mountains." It was created on spec for Boundless. Another is a large-scale painting by Dedron, a Tibet-based artist, depicting the train connecting Tibet to the rest of China. For artist Tenzing Rigdol, the purpose of the exhibit is to get people to pay attention to not only the art, but the world. Rigdol's featured works include two mixed-media collage pieces with an outline of the Buddha, along with Chinese text that is actually a proposal by the Tibetan Government in Exile for self-governance — clear examples of his artistic point of view. "Entertainment is about getting attention, whereas art is about paying attention," he said. "Entertainment is about making people forget the question, and art is about raising the question." Rigdol has two other pieces in the exhibit; one is Wrathful Dance. The mixed-media work is a response to the self-immolation of monks in Tibet. Through reports and his own research, he's counted 165 acts of self-immolation and deaths, mostly by monks and nuns, but believes there are more. "This is something that has bothered me for so long. I still can't wrap my mind around it. They are burning themselves to have their voices heard. This is something I've never before imagined they would do," he said. "I did research and there's been this is other countries — the Czech Republic, Egypt, Vietnam. I'm trying to understand it from an individual point of view." Rigdol's art is also featured in the 2013 documentary, Bringing Tibet Home, a pointed and moving exploration of the exiled life. Born in Nepal and with parents from Tibet, Rigdol has never legally stepped foot in Tibet. Like all other Tibetans in exile, he is unlikely to be granted permission to go to his motherland. For the art show, 20 tons of soil were smuggled from the Tibetan regions to Dharamsala, India — where a large exile community lives — and blessed by the Dalai Lama himself for a site-specific installation, titled "Our Land, Our People." It allowed elders in the community to touch the soil of their homeland, a place they'll probably never return to so long as Tibet is under China's rule. One of the men targeted by "BBQ Becky" reflects on the incident and what the aftermath means for Oakland.